After Weapon Mastery goes live, you’ll notice every weapon now has a series of levels that players can progress through by dealing damage and defeating opponents. 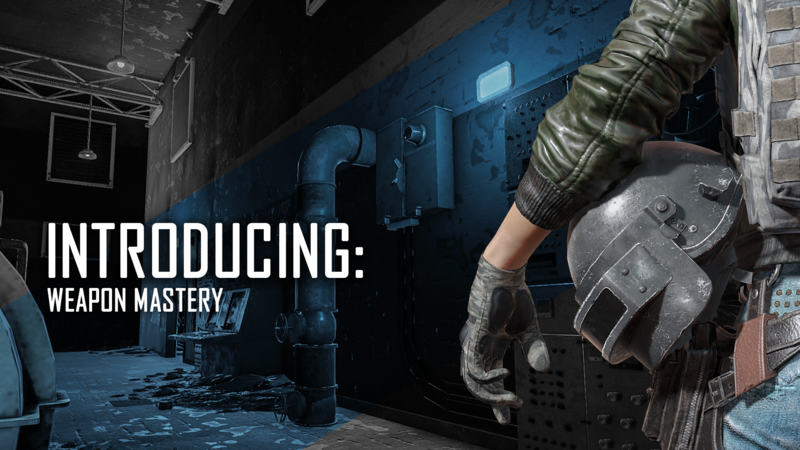 It’s important to note however that both strategy and precision also have an influence on how quickly you level up your weapons.Weapon Mastery aims to encourage healthy play in PUBG where both weapon skill and the effort to be the last man standing are rewarded in tandem. Speaking of rewards, Weapon Mastery features a number of new things to unlock and collect, all of which are free to those who earn them. No Weapon Mastery content will ever be purchasable, so be prepared to work for this specialized loot. Giving players the opportunity to show off their accomplishments and personalize their look are very high on our priority list. We’ve explained how you earn rewards, but here’s a taste of the perks and levels coming to Weapon Mastery. …and no, you can’t defeat your own teammates. Don’t be that guy. Some of the Weapon Mastery team will be doing an AMA on Reddit on 04/22/2019 from 10am to 1pm ET, which we’ll link through our social channels. This will be a great time to ask the developers and designers any questions related to this upcoming feature! We’ll also be collecting questions separately from those who are not able to participate in the AMA because of the time difference, so please leave your questions here as comments! We are going to collect and send them to AMA so that developers can answer. These answers will be posted on the Q&A announcement after the event, so watch for upcoming announcements for your chance to get answers!